Extraordinary Psychic, and Freeing the Genie Within. 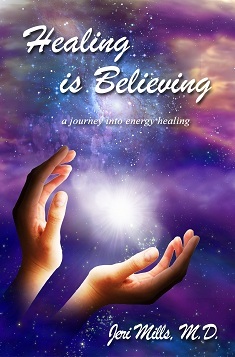 Healing Is Believing recalls the true story of a woman who has dared to follow her heart, to step out of the confines of Western medicine and embrace the world of energy healing, a world where anything is possible. The only limitations are the walls created by her own mind. Her story will move readers to laughter and tears as it helps them to suspend their own dis-belief and strengthen their faith in the possibilities life has to offer. How did a physician come to be an energy healer? For me, energy medicine is the realization of a dream that began when, as a teenager, I started reading science fiction and fantasy novels. Through university, veterinary school and later medical school and residency, whenever I felt frustrated by the limitations of modern society and Western medicine, I escaped to the worlds of Anne McCaffrey and Marion Zimmer Bradley, worlds where people were psychic, where surgeons performed healings with their hands and with their minds instead of with the crude knives that were the tools of my trade. Still, it was all just a dream. Then, in 1993, I moved to Tucson, Arizona and discovered real people who were living the life that had always been the core of my dreams and fantasies. Shortly after arriving in Tucson, I enrolled in a creativity workshop at Pima Community College. The instructor, Diane Ealy, a woman with a PhD in psychology, mentioned in passing that she was able to channel healing energy through her hands. My heart lit up. This bright, educated woman claimed to be able to do what I had always dreamed of. “Sure,” she replied, but she never did. Still, the seeds were planted. Over the next few months, I learned to meditate and developed the habit of sitting and meditating in my car for ten or fifteen minutes each morning before going into the hospital or into my office. I always began the session with one of my favorite exercises from Shakti Gawain’s book Creative Visualizations. Breathing green, healing energy up from the core of the earth, I let it flow through my body and then allowed it to leave through the top of my head. At the same time, I drew the pink, creative energies from the Universe in through the top of my head, let them flow through my body, and then drain out from the base of my spine into the center of the earth. The sessions left me feeling relaxed and wonderful, but it never occurred to me that I might be able to channel this energy for other people—until there was a need. One morning when I was working on labor and delivery, the first patient to be admitted to my service was a fifteen-year-old girl in active labor. As I entered the room, she cowered in the back of the bed, her arms wrapped protectively around her body. When a contraction hit, she screamed, threw her arms in the air, writhing about the bed like a wild animal caught in a trap. Until the girl calmed down enough so that we could start an IV, I couldn’t give her any pain medicine, let alone the epidural she was begging for. I did the only thing I could do to help a patient in that situation. I took her hand in mine, looked into her eyes and began showing her how to slow her breathing as we do in meditation or in Lamaze. Gradually, she started to relax. As we continued to hold hands and take slow, deep breaths, I became aware that I was doing the energy channeling meditation I did in the car every morning, only something was different. Instead of letting the energy run out through the top of my head and the base of my spine, I had been drawing the energy into my heart. I could feel it moving from my heart, down my arm and from my hand into hers. My patient became calm and still, a poster child for Lamaze! At that point, we did offer her the epidural she had requested earlier. She lay quietly in my arms while the epidural was inserted into her spine and then slept until it was time to deliver her son. Since that day, I have become a Reiki Master Teacher and have studied Therapeutic Touch, shamanic healing and multiple other healing modalities. I have integrated aspects of all those therapies into the healing work that I offer to friends and patients alike. Amidst all that study, a very special pattern has emerged: Once I hear that it is possible to do something energetically—anything from opening up the narrow pelvis of a laboring woman to parting the clouds to prevent rain from falling on a special event, even if no one has taken the time to teach me the “necessary techniques”—when the need arises, my body/mind/spirit automatically do what is necessary to perform that healing. There is no conscious effort. I just do it. For a long time I thought the only limiting factor was my belief that something was possible. Over the years there have been a number of instances where my ego has been shocked to discover that if my patient’s belief or will to heal is strong enough, I can be used as the vehicle to bring healing to them to a degree that even I thought was beyond the realm of possibility. In my first book, Tapestry of Healing, I shared the story of my discovery of my own ability to channel energy, and my experiences as I learned more about energy medicine and integrated it into all aspects of my life and my medical practice. Healing is Believing recalls the next decade of my journey. I have moved from obstetrics and gynecology to the emergency room. I have traveled to many parts of the country, making new friends and saying heart-wrenching goodbyes to others. Through it all I have followed my heart and stepped out of the confines of Western medicine to embrace the world of energy healing, a world where anything is possible, a world where the only limitations are the walls created by my own mind. The journey has been fraught with lessons about life, about the nature of healing and about myself. The experiences have been uplifting and enlightening, gratifying and humbling. I hope reading about them will bring some of the richness to your life that they have brought to mine.